Pregnant women often feel tired and exhausted especially late morning and also late afternoon. Many then often need a little “pick me up” and grab a sugary and often highly processed snack like a candy or a granola bar (which most often is also a candy bar) or a sugary pastry. That might give the energy you need, but only for a little while, than your blood sugar comes crashing down and the cravings for more sugar return. 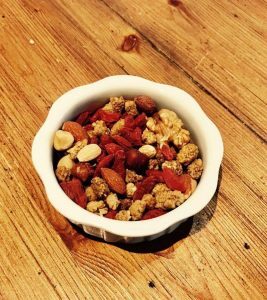 Making your own trail mix is not only super easy, but more important it delivers you highly beneficial nutrients that you need during this special time in your life. It is also convenient and easy to have in your purse and take it everywhere with you. Dried Mullberries: Contain high levels of vitamin C 100g can deliver up to 190% of RDA, also rich in protein, iron and calcium. Almonds: High levels of Magnesium and vitamin B6 (low levels are associated with depression and anxiety during pregnancy). Also a good source of calcium. Neutralizes stomach acid which helps prevent heartburn. Walnuts: A great source of Folate and omega 3 fatty acids both being absolutely essential during pregnancy. Also good source of biotin which is important for healthy hair, skin and nails. So, before you get stranded somewhere and you feel tired and week and you want to eat something NOW, prevent the often unhealthy snack attack and be prepared with a bag of your own delicious trail mix. This way, instead of grabbing a candy bar which spikes your blood sugar and insulin production, often also blocks your digestive system, leaving you constipated and irritated (I’ve been there……often). Reach for your healthy trail mix that stabilizes your blood sugar, supports your digestive system (helps you poop), prevents heart burn, delivers you vitamins and minerals ad so much more good stuff. Yum! I’m not pregnant but this is exactly what I need to get my sugar cravings under control!